Tecnicos took 1/3. Astral had many bad spots. Dallys may now be "Dallys la Gladiadora" - announcers used that name. She's got a new dark look, black hair with blue highlights and a gladiator helmet. Marcela welcomed her to the ruda side by hitting her very hard, including spiking her on the second fall Michinoku Driver. Third fall came down to the feuding two, Marcela double stomping Dallys but Dallys kicking out, then using a double underhook suplex for the win. Dallys challenged for Marcela's title. Originally announced with Ephesto, Misterioso replaced him on Monday. 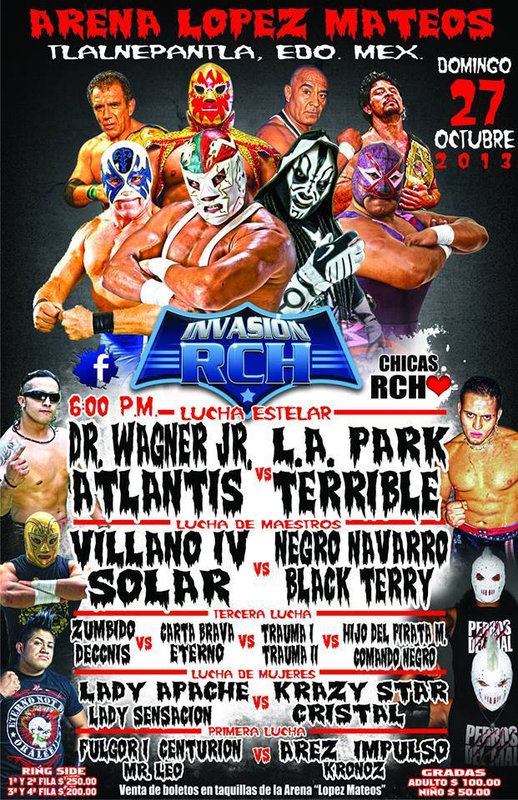 Rudos took 1/3 in the usual match with most of these guys. Gran Guerrero fit in fine. 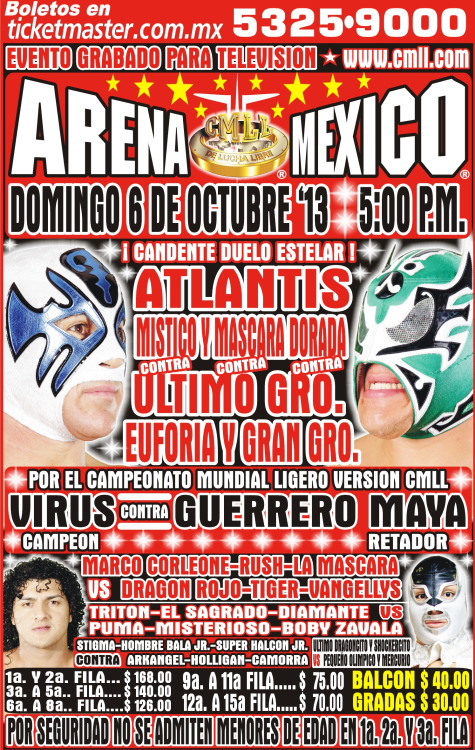 Originally announced with Mascara Dorada. Titan replaced him on Monday. Titan took a lot of the match, but Averno (again) threw him into the barricade on a tope, then pinned him with one hand in about seven minutes. Titan needed medical attention after the match, which didn't stop Averno from unmasking him. 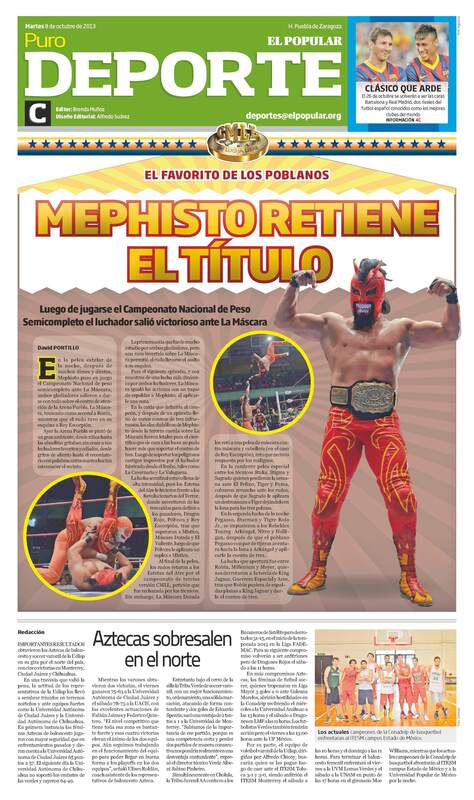 Dragon Rojo was originally announced, but replaced by Ephesto on Monday. Maximo & Super Porky were DQed for excessive violence on Rey Escorpion - specifically, closed fists, which will be legal next week. Rudos were wearing their TRT gear (where appropriate), but were wearing Bullet Club t-shirts and referred to as Bullet Club Latinoamerica. It appears Tonga beat Rush for the deciding pin. Sensei had a white gi. Tecnicos took 1/3. Camorra and Stigma continue to feud. Camorra beat Stigma in the first and third (cleanly), only losing the second by excessive violence DQ. Tecnicos took falls 2/3 in a good match. Delta & Maya beat Okumura & Namajague in the third, then challenged for the Arena Coliseo Tag Team Titles. Fiebre Amarilla did not really answer. UG pulled Valiente's mask for the DQ after ripping it up during the match. The two talked about a singles match next week. 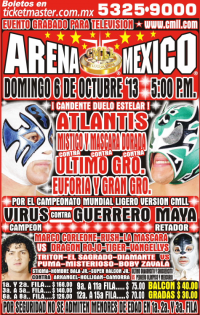 Originally announced as Dragon Rojo, but changed to Ephesto on Monday. Maximo subbed for Titan the day of the show (mentioned at the start.) Rudos took 1/3. Bonus match. Furia Nazi (or at least A Furia Nazi) hasn't appeared here since 2006. Yaki replaced Samael. Tecnicos took 1/3. Tecniso took 2/3. Barbaro and Fuego feuded, and Barbaro was caught fouling Fuego in the third. 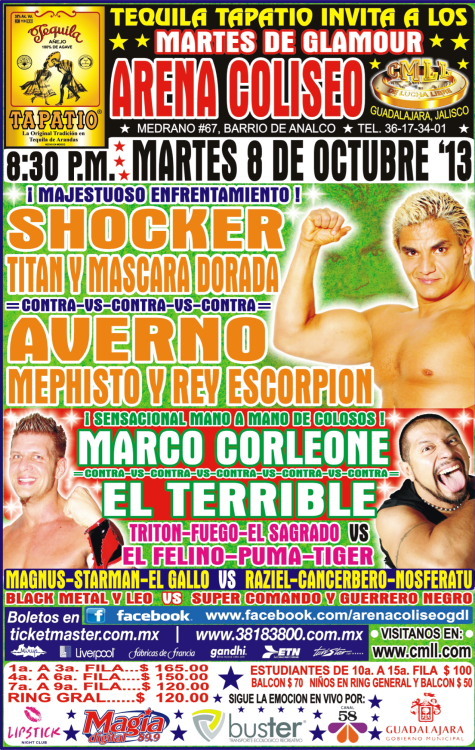 Titan replaced Maximo (who swapped places with him in Coliseo.) Tag champs took 1/3, Tonga sneaking a foul on Rush thanks to a Bucanero distraction. Rush Driver on Tonga for the win. Recap says Polvora beat Titan, which doesn't quite make sense with what they're going. 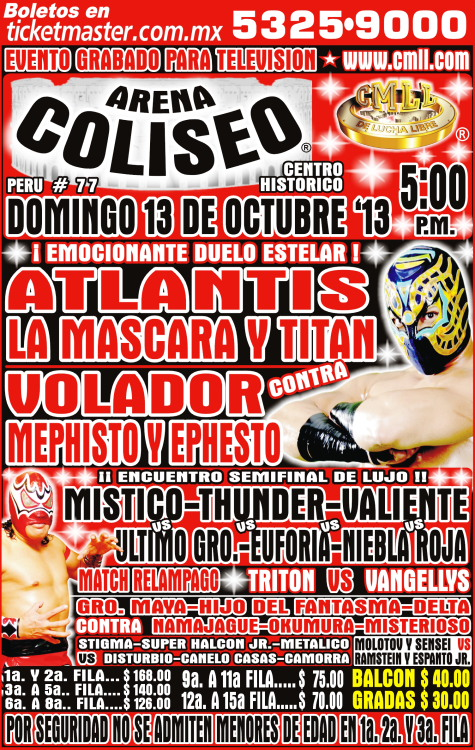 Revolucionarios challenged Estetas for a trios title match and Estetas accepted this time. Rudas took 2/3, Amapola defeating Marcela. 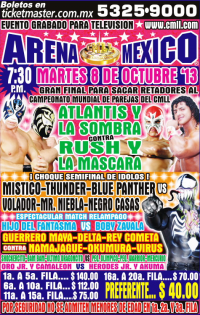 Rudos took 2/3, Olimpico beating Fantasma. Rudos took 1/3, Averno sneaking in a foul on Panther. Sensei was announced, but Metalico was subbed in ahead of time. 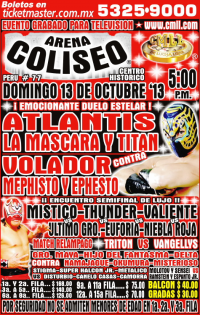 Misteriso replaced Herodes the day of the show. Bam Bam was announced, but Acero was subbed in days ahead of time. Straight falls, with Warrior fouling Fantasy. 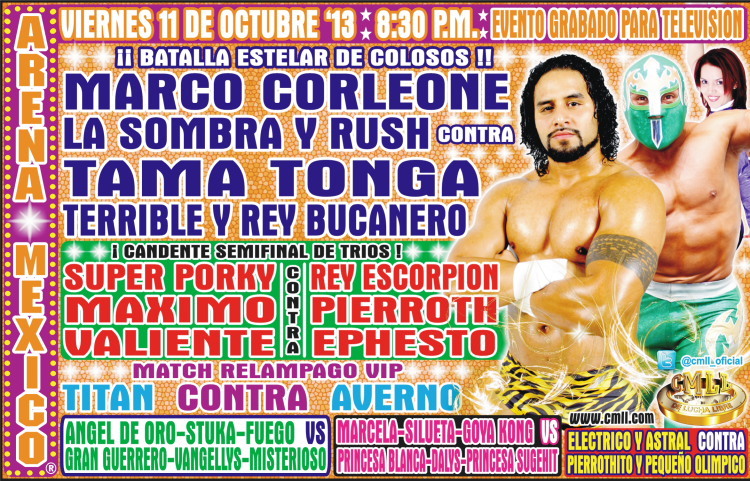 Tecnicos took 2/3, with the tecnicos again challenging for the Arena Coliseo Tag Team Titles. Mr. Aguila's return. Both he and Volador wore joker makeup (making it hard to tell them apart in close photos.) Volador Sprial on Sombra. Titan replaced Diamante. Tecnicos took 2/3 in a disappointing match. Ephesto replaced Terrible. Rudos took 2/3 in an OK match. Marcela is champion. Ninth defense. First fall ended poorly, with Dallys pinning Marcela for three, then ignoring to put on a scorpion for the submission. Marcela took the second and the third with the top rope stomp and Michinoku Driver to keep the title. 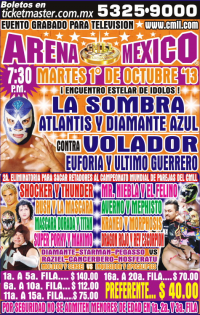 Niebla Roja wrestled the first fall in a shirt honoring his late uncle. Rudos took the first with a triple submission. Guerreros take 1/3, UG beating Mistico clean with the Guerrero Special. Escorpion took falls 1/3 (there were falls! ), the last when Maximo could no longer stand the beating his father was taking and attacked Escorpion. Zavala seconded Escorpion. CMLL honored El Brazo after the match. Tama Tonga & Rey Bucanero were champions making their first defense, but Bucanero is hurt. La Mascara & Rush won the tag team titles by forfeit, and Terrible replaced Bucanero for a non-title match. Terrible and Tonga won, setting up the tag team title match again. Stukita brought his Norte Lightweight Championship to the ring. Namajague took multiple top rope splashes for the loss. Delta & Maya again challenged for the Arena Coliseo tag team titles, and Namajague (who wasn't actually clear on what was said since it was in Spanish) accepted on behalf of himself and Okumura. Blue Panther replaced Marco Corleone. UG took 2/3. He took the third with an Ultimo Guerrero Special (in a match which was an Ultimo Guerrero Special.) UG grabbed the microphone to praise Valiente after the match. Atlantis worked twice, replacing Shocker here. Tecnicos took 2/3, the last with Mephisto fouling Mascara. Match appeared to build towards a Mephisto/Mascara match, though the announcers did not seem in on it. Rudos took 2/3, Tama beating Titan. Dragoncito was an announced substitute for Bam Bam and beat Violencia. Goya splashed all three rudas. 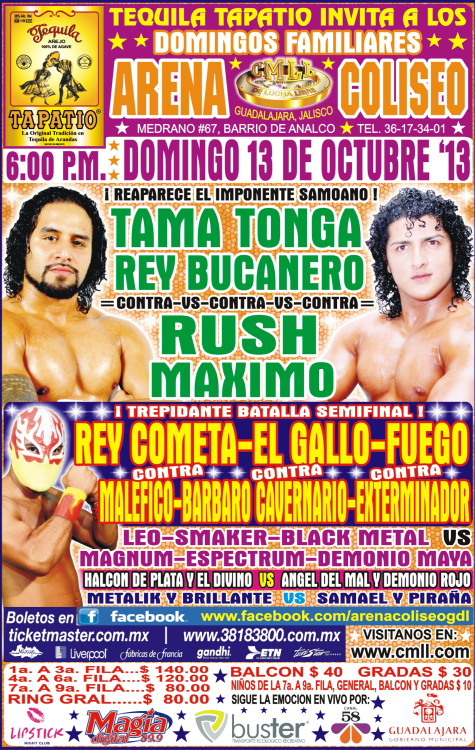 Maximo & Titan replaced Marco & Thunder, while Tama replaced Bucanero. Vangellys snuck in a foul on Rush for the win. Mr. Niebla was originally announced, but replaced by (the more logical) Dragon Rojo ahead of time. Estetas came in as champions. 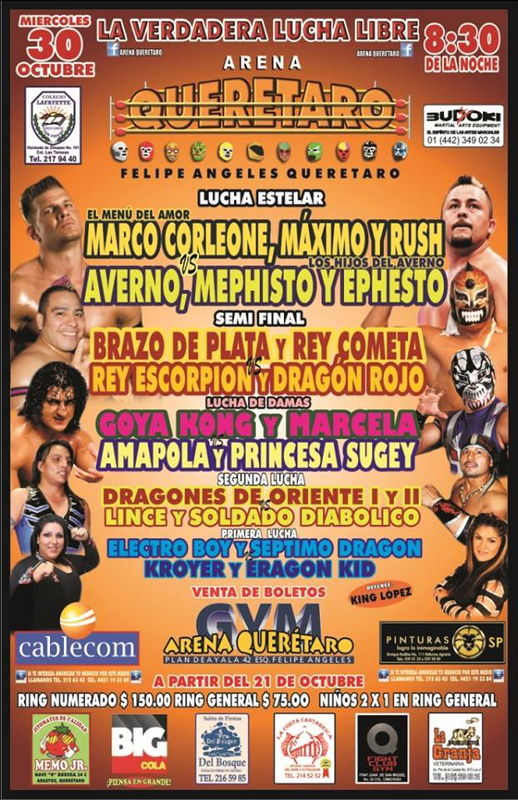 Polvora beat Mistico in the second, Mistico beat Polvora in the second, Dragon Rojo Dragon Bombed Valiente in the third but Mistico got Escorpion with La Mistica to win the match. Fourth defense. Guadalajara vs Cats. Puma snuck in a foul on Gallo in the third, rudos taking 1/3. Tecnicos demanded a rematch for next week. Tecnicos took 2/3, Mistica on Ultimo Guerrero. Pequeno Warrior fouled Aereo for the DQ. Starman was announced as a Diamante replacement a few days ahead of time. Virus submitted Sagrado. Cometa escaped the Gory Driver into a sunset flip for the win. Misterioso had his usual freak out after a usual surprise loss. Vangellys used the ropes to pin Atlantis. Tecnicos took 2/3, Estrellita & Goya beat Seductora & Sugheit. Marcela & Dallys continued feud. Peste Negra took 1/3 and were the stars of the match. Mascara Dorada won with a rope bounce casadora cradle in a quick five minutes match full of big moves. 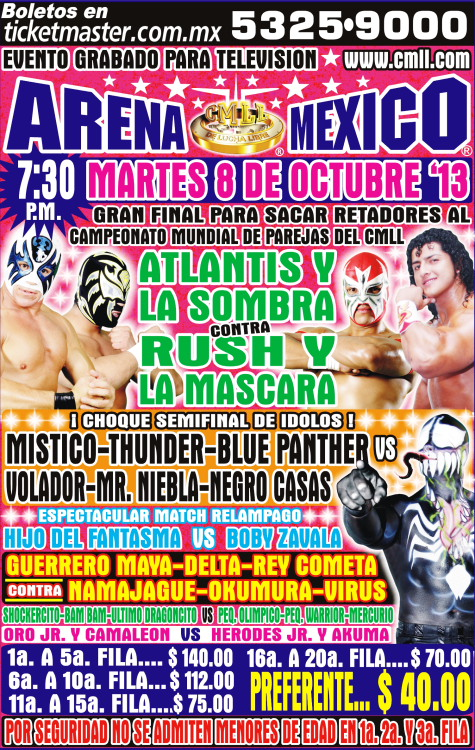 Mistico & Panther replaced Sombra & Panther during the week. Sombra replaced Marco Corleone during the week. Tonga cheated to beat Rush to use the ropes. Evola's team took 2/3. Divino replaced Halcon de Plata. Tecnicos took 2/3. Espectrum fouled Leo for the DQ, while Jocker took Esfinge's mask. Barbaro came in as champion, but Fuego took falls 2/3 to win the the title. Porky replaced La Mascara. Rudos took 1/3, Euforia pulling Sombra's mask and pinning him. Sombra challenged Euforia to a title match next week. Astral replaced Stukita - it was announced a head of time, but they still somehow played Stukita's music. 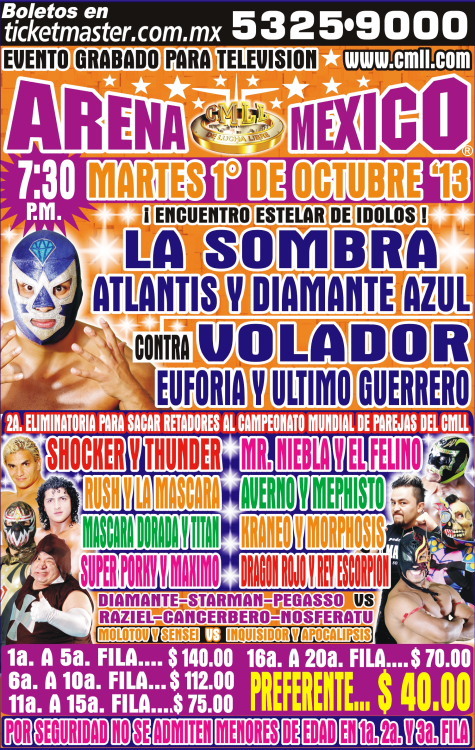 Starman was an announced replacement for Diamante. Tecnicos took 2/3 in a good match, Sagrado beating Misterioso. Ephesto pulled Triton's mask for the DQ. Tecnicos took it in straight falls. Maya feuded with Namajague all match and finally beat him with Sacrafica Maya. Maya demanded to know where Okumura was (hasn't been around the last two weeks) and demanded a title match for next week. Namajague - in Japanese - said he did know where Okumura was and was not definite about the title match, though the announcers all thought it was happening. Tecnicos took 2/3 with Titan beating both Averno and Mephisto in the third. Titan feuded a little bit with Mephisto, and challenged to a title match. Mephisto eventually said yes. Dallys beat Marcela with a casita, asked for a title rematch, will get it next week. Rudos took 2/3, Terrible beating Rush. Rush promised revenge on Friday. Tecnicos took 2/3, the last when Volador took Sombra's mask. Sombra challenged Volador to a mask versus hair match, Volador said no. Cats had Zacarias to counter Gallito. Tecnicos took 1/3, Triton pinning Tiger and Puma beating Smaker. A man proposed to his girlfriend after the match; she said yes. Tecnicos took 2/3, Angel de Oro beating Misterioso twice. Bam Bam actually appeared. Warrior wore his Psicosis mask for some (no) reason. Tecnicos took 1/3. 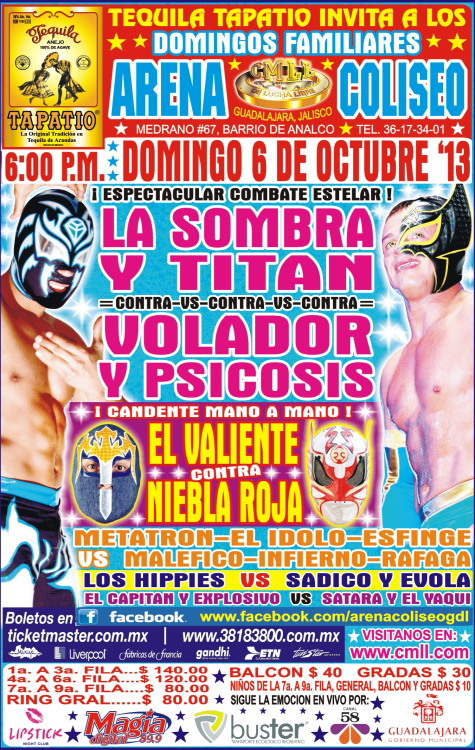 Pegasso surprised Virus with a cradle in the first, Virus fouled Pegasso in the second. Amapola used the ropes to beat Estrellita. Tecnicos took 2/3, Atlantis getting the win. Porky splash for the win.